Posted on 19 January 2010 by Jonathan Abrams. Warning: This review may contain what some may consider ‘spoilers’. Although, few of the details in the review would be surprising to anyone even remotely familiar with the life of Charles Darwin. But rest assured that the movie is worth your time and money, so go see it and come back if you’re worried about spoilers. 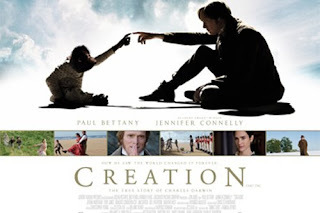 Creation is the latest film to be released about the difficult years in Charles Darwin’s life when he was writing his historic book On the Origin of Species. There was another film produced by PBS released earlier this year, but I have not yet seen it, but it is clear that Creation has the bigger budget, star power, and marketing push. It is scheduled to be released nation wide (in Canada) this Friday and is starring Paul Bettany as Charles Darwin. I wasn’t expecting to see a story about Darwin’s famous work and how it changed the world, I knew that the movie would be mostly about his troubled personal life. If you want to learn about Darwin’s theories and how he came upon them, this isn’t the right movie for you. On the other hand, if you want to learn about Darwin, the man, then this is the film to watch. It did have some small bits where it explored the theory (especially the bits about nature being unpleasant), but there was no mention of the Galapagos Islands, finches, common descent, and I struggle to remember if the words “natural selection” were uttered more than once. When I was in England last year I visited his home in Down, Kent, his burial place at Westminster Abbey, and a large exhibit about his life and work at the Museum of Natural History in London (I OD’d on Darwin). Despite seeing all of these interesting places and learning about Darwin and his theory, I didn’t feel like I understood the man. The movie seemed to give me a peak into the torturing dilemmas faced by Darwin. It presented the scientific titan as a very sickly and pitiful individual. The movie spent much of the screen time showing Darwin’s physical and mental suffering. The physical suffering was caused by a mysterious crippling illness, for which only painful and ineffective pre-scientific remedies were available. The mental suffering was a combination of guilt over the death of his daughter Annie and the fear of his work’s implications. It’s as if Darwin needed to suffer so that humanity could benefit from his insights. Maybe the movie should have been called The Passion of the Darwin? I don’t think the suffering of Darwin was the main theme though. Both his physical and psychological suffering appeared to be caused by guilt. Both the guilt he felt over Annie’s death (for which he blamed himself) and guilt for upsetting his wife with his work (or was it guilt for “killing God”?). Only once he can conquer his crippling guilt can he reach his destiny. I’m no film critic, but I thought the film was technically superb. The cinematography, acting, and music were all top-notch. It was very pleasing on the eyes (and not just due to the presence of Jennifer Connelly). I can’t wait to see this film on blu-ray. I got a kick out of finding the small references within the film. If you watch carefully, you’ll notice small references to religion, such as the position of the fetus’ hand in the opening credits. There are also references to other points in Darwin’s life, such as the mentioning of the giant sloth of Argentina, whose fossil he discovered while on the Beagle’s voyage. The movie succeeds in its attention to detail, and will reward those who watch the film multiple times. I also appreciated the use of Darwin’s moving hairline to help us keep track of the movie’s timeline, which was handy since it felt like Dr. Emmett Brown was editing the film. While I was deeply moved by Darwin’s personal struggles, I wish more time had been dedicated to the controversy surrounding his work. One of my favourite scenes involved a visit by Thomas Huxley (played by Toby Jones) where he attempts to convince Darwin to finish his work. It was entertaining to see the man who would later be labeled “Darwin’s Bulldog” inspire a man already sick due to his work’s implications with lines like: “Sir, you’ve killed God.” It’s a crime that Huxley only appeared in one scene! I look forward to the film’s sequel about the fallout from Species’ publication. It should be called Creation 2: Huxley’s Revenge. The only other nitpick I have is the creative license taken by the filmmakers for showing Darwin as not just mentally tortured, but downright mad at points. I’m not aware of any historical claims that Darwin was visited by ghosts. His conversations with the deceased were clearly for dramatic purposes but I thought they were unnecessary since the flashbacks were sufficient at making me feel Darwin’s loss. The melancholy and melodrama of the film may not be for everyone, and it took some liberties with details of Darwin’s life, but on the whole it was a great film that gave us a taste of the personal sacrifices Darwin made for the advancement of science. It likely won’t convince any creationists that evolution is a fact, but maybe it will help us all realize that the theory of how life evolved wasn’t effortlessly invented overnight, or even in seven days. Bonus trivia: The movie’s screenplay was written by John Collee who also wrote the screenplay for the movie Master and Commander: The Far Side of the World. That movie starred Paul Bettany as a Darwin like figure that explored the Galapagos Islands. Coincidence?